These days when it comes to Greek wine, Santorini seems to get all the attention. Well deserved I would say for this breathtaking place with its heritage vines (some up to 400 years old) makes all other regions of the world look rather silly. Yet Greece is not simply Santorini but has other impeccable wine regions to explore. Cephalonia is indeed one of these. Located in the Ionian Sea (west of mainland Greece, with the Aegean sea to its east), Cephalonia has a great potential and can be considered as Santorini’s alter ego. 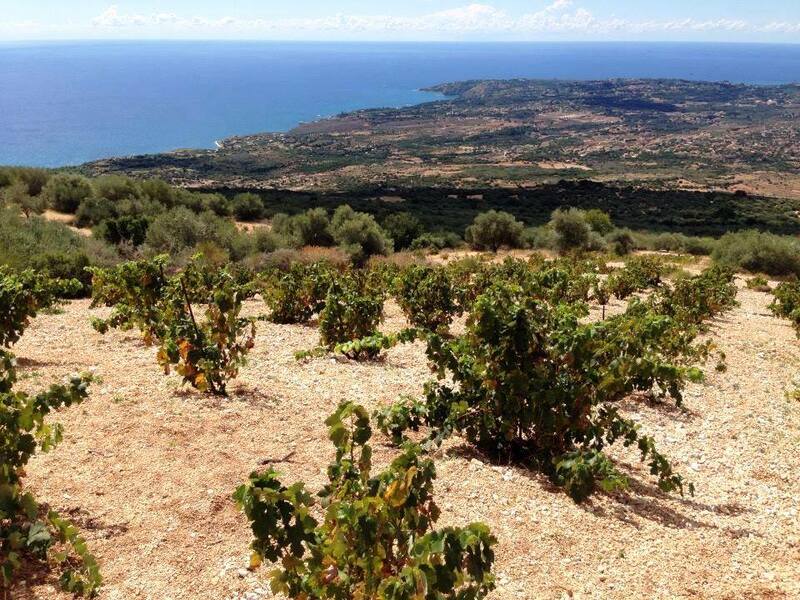 What makes Cephalonia a region to look out for is the equation for wine greatness: Interesting soils which are mostly free-draining limestone, high altitude terroirs rising up to 850m, own rooted vineyards to a great percentage (70% are estimated ungrafted) and a single variety with character and class, Robola. Last but not least, quality oriented producers. Robola is the undisputed star variety covering 120 hectares of the total 160 of the island according to the cooperative’s director Constantinos Bazigos with the Ministry of Agriculture giving inflated numbers. Although it sounds like Friuli’s Ribolla Gialla, DNA profiling has failed to prove it so. It is a vigorous variety, prone to rot and powdery mildew. This is exactly why it is planted inland in the Valley of Robola (pictured below) in order to avoid the humid climate of the coast. Alexandros Doukas, winemaker of Gentillini winery (dubbing also in Santorini) says, ‘’it is easy to make characterful wines from Assyrtiko but with Robola this is very challenging because the variety can oxidise in a flash’’. It produces elegant wines with a discrete lemony, sometimes floral and mineral profile followed by a medium bodied palate that is vivacious with bright acidity. To put it simply, Robola is like an Assyrtiko with less intensity. 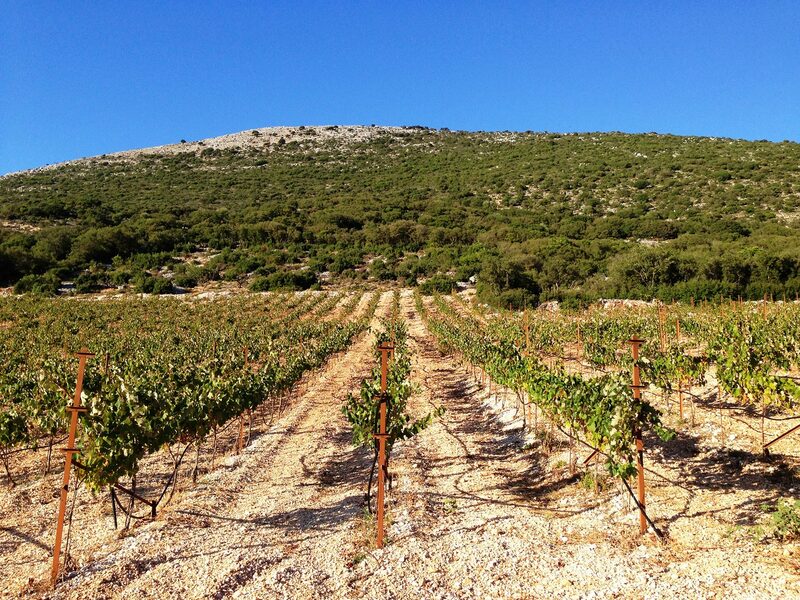 The variety gives the name to the region’s PDO, Robola of Cephalonia. Actually this is the only appellation in Greece for dry wines that refers to one variety and not just to a region. And although that may sounds prestigious, in effect it isolates the variety locked in a golden cage, as no label outside the PDO region is allowed to bare the variety. Robola zone extends from 350 to 850 m high encompassing several villages with Valsamata being the most important one covering 80% of the plantings. Others include Fragata, Troanata, Mihata, Epanohori and Vlahata. Some of the most exciting terroirs are located in the high altitudes of Fagias (pictured below) where top quality fruit is sourced for Gentillini and Melissinos wineries. Τhe Robola cooperative absorbs the major percentage of production having as members 300 growers owning 0.35 ha on average and producing 450.000 bottles in total. Out of the estimated 160 hectares the cooperative gets more or less two thirds. What is very interesting is the way that they have managed to motivate the vinegrowers for harvesting better quality fruit. Bazigos comments that this achievement came when they introduced grape prices according to quality. Initially Grade A and B have been set. Currently, there are thoughts to define another grade according to the altitude aiming to reach four grades in total. Smaller scale, boutique wineries with a production of less than 60.000 bottles add up to a fascinating canvas. Gentillini, located in Minies outside Argostoli, the island’s capital has a long standing tradition to adhere to. Founded in 1984, is family run by Marianna Cosmetatos and Petros Markantonatos, both effortless contributors to the region’s evolution. 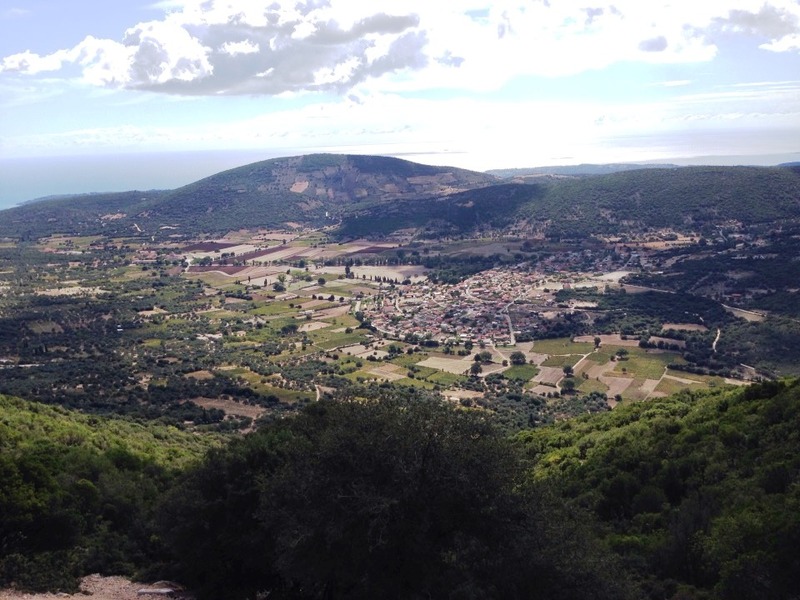 Sclavos in Lixouri is a producer committed to natural winemaking; an idiosyncratic dreamer, Sclavos crafts fabulous terroir-driven wines that are improving year by year. In addition Melissinos shows good potential producing fine examples of local varieties. Foivos produces interesting whites and experiments with amphoras for dry reds while Haritatos captures a vibrant Muscat in the bottle. Robolas can be sublime, other white varieties like Vostilidi and Zakynthino are promising and reds from Mavrodaphne combine fruitiness with a complex savoury character. Moreover sweet wines from Muscat and Mavrodaphne can be masterpieces. Yet, the future is challenging when it comes to which issues arise! Esca is, unfortunately, an eminent threat; Kiki Siameli winemaker of Melissinos describes how whole vineyards have been vanished, leaving behind just beehives in Deilinata. Siameli suggests that if you open the wood (shown by Sclavos in next photo) you might get some extra years of life but then again this is hard work for the average grower of the island which is more or less 60 years old. 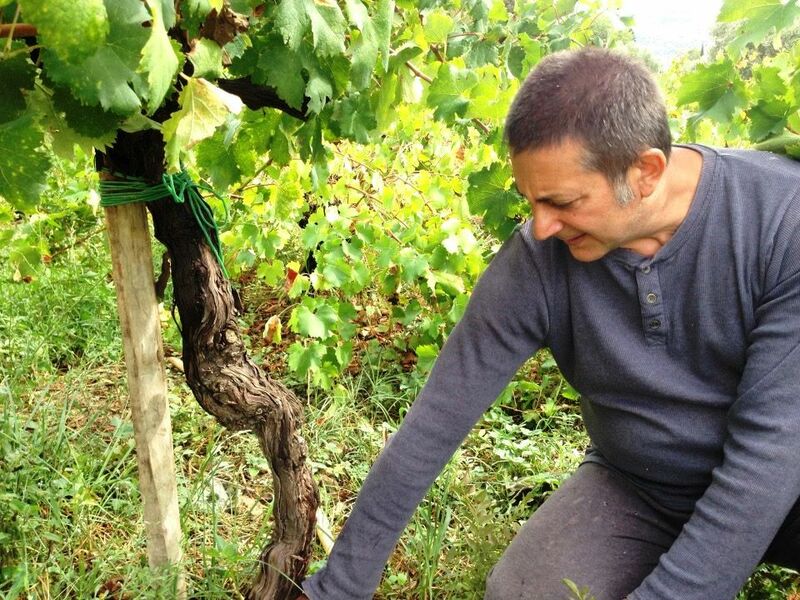 Fagias, one of the most renowned terroirs is also under threat, she concludes. Phylloxera came late in the island so it is a prominent problem together with the diminution of the wine region from 350 hectares ten years ago to 160 hectares nowadays. A change in Greek wine legislation allowing screwcaps for PDO wines is also very much anticipated by the producers who feel that a tighter closure may benefit Robola, retaining freshness for longer. Great challenges to overcome but not impossible! Cephalonia has many to offer to wine enthusiasts seeking for excitement and provided that wine producers win the game, future looks bright like the Ionian sun!